안국사는 안국산(일명 은봉산)에 위치한 폐사지(廢寺地)로 1929년에 다시 세웠다고하나 또다시 폐사되었다. 이곳에서 200m쯤 떨어진 곳에 높이 5m에 가까운 큰 석불입상이 있다. 머리에는 커다란 사각형의 갓을 쓰고 있으며, 얼굴은 신체의 비례상 어색하게 큰 편이다. 불상의 몸은 대형화되었는데 인체의 조형성이 감소되어 네모난 기둥같은 느낌을 준다. 또 몸과 어울리지 않게 팔과 손을 붙여 비현실적인 모습을 하고 있다. 오른손은 가슴에 대고 있으며, 왼손은 배에 붙여 엄지와 가운데 손가락을 맞대고 있는 모습이다. 좌우에는 본존불을 모시는 보살상이 있는데, 오른쪽 보살은 허리까지 묻혀 있고 왼쪽 보살은 머리만 파괴되었을 뿐 형식은 본존불과 같다. 고려시대 충청도 지방에서 유행하던 괴체화한 불상양식을 잘 반영하고 있는 것으로, 충주 미륵리 석조여래입상(보물 제96호)과 함께 주목된다. 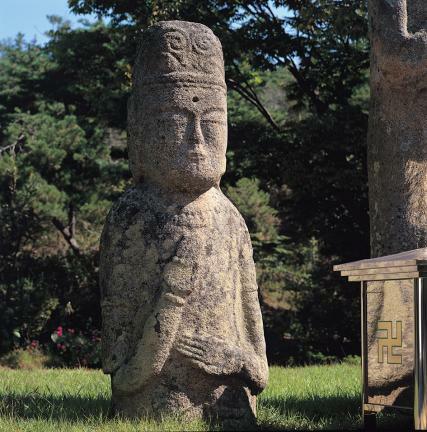 This stone standing Buddha Triad is located at the former site of Anguksa Temple on Anguksan Mountain (also known as Eunbongsan Mountain). The temple was rebuilt in 1929, but was closed again. 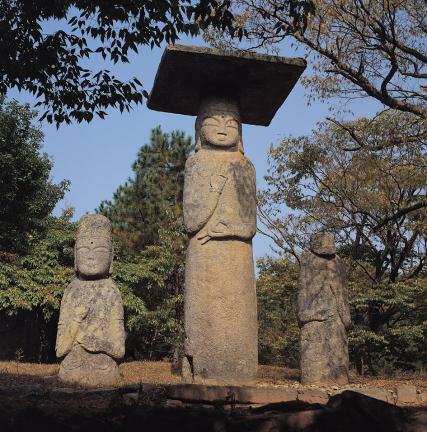 There is also a large 5-meter-high standing stone Buddha located about 200 meters away from this site. 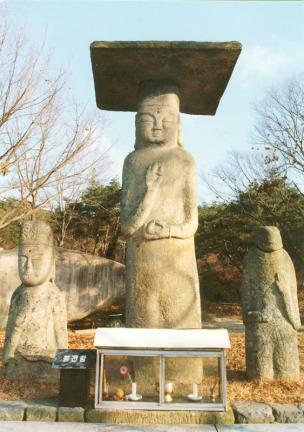 The principal stone standing Buddha in the middle is wearing a large square Korean traditional hat, and has a face that is disproportionately large compared to the body. 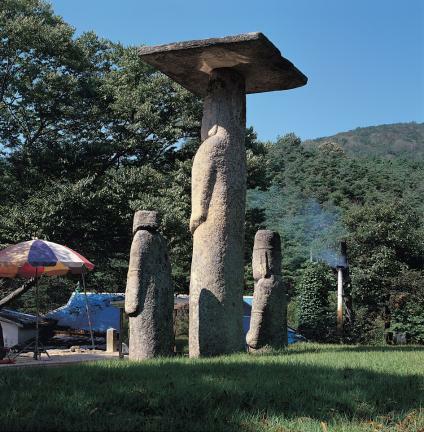 The oversized body exhibits a simple shape resembling a square pillar. The right hand lies across the chest while the left hand lies on the stomach with the thumb and middle finger pressed together. 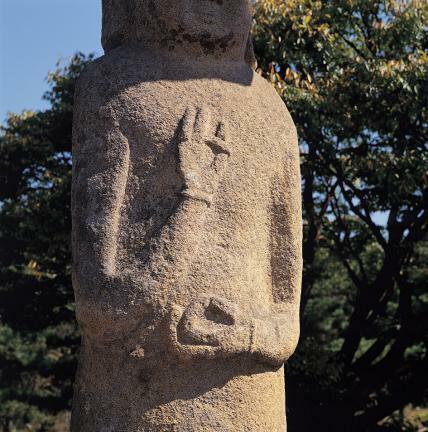 Bodhisattva statues were also erected to the right and left of the principal statue. 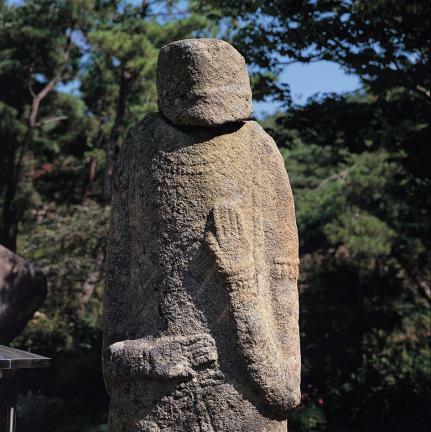 The Bodhisattva on the right is buried to the waist, while the one on the left has the same form as the principal Buddha statue, although its head is badly damaged. 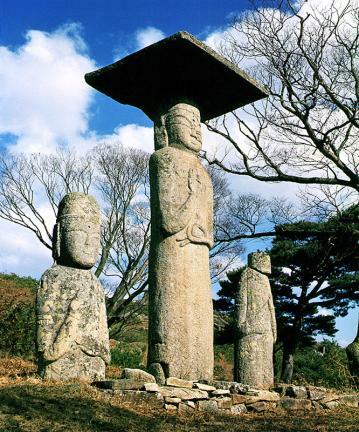 The Triad was influenced by the popular style of Buddha statues of Chungcheong-do during the Goryeo Dynasty. 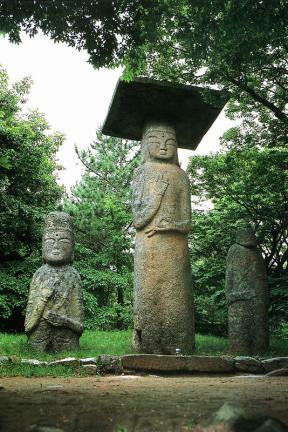 It is a notable example of a Buddha triad along with the Stone Standing Buddha in Mireuk-ri, Chungju (Treasure No. 96).